MUNICH, Germany and LAS VEGAS, Nevada – January 9, 2019 – Designers of always-on wearable and internet of things (IoT) devices now have an easier way to extend battery runtime while shrinking form factor with the latest tiny, highly integrated power-management IC (PMIC) from Maxim Integrated Products, Inc. (NASDAQ: MXIM). The ultra-low-power MAX20345 integrates a lithium charger and debuts a unique architecture that optimizes the sensitivity of optical measurements for wearable fitness and health applications. “With sales of fitness and wellness wearable electronics expected to rise to over 114 million units by 2020, there is increasing demand for better, more precise sensing technology for measuring health vitals including heart rate and blood-oxygen levels,” said Kevin Anderson, senior analyst for power semiconductors at IHS Markit. “Maxim is continuing to deliver precedent-setting innovations in the wearable healthcare arena. 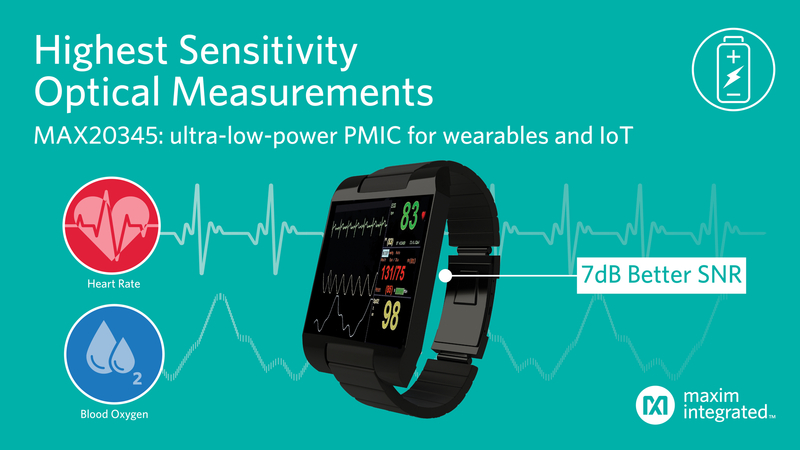 Our new MAX20345 extends our portfolio of ultra-low-power PMICs for wearable and always-on applications, bringing to the market a solution that enables the highest sensitivity optical sensing in wrist-worn form factors for more accurate vital-sign measurements,” said Frank Dowling, director of business management, Industrial & Healthcare Business Unit, at Maxim Integrated.